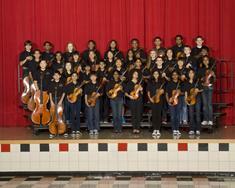 Fowler Middle School currently has the largest orchestra program in FriscoISD with over 200 students! We proudly feed students from Borchardt, Riddle, AND Taylor Elementary schools. 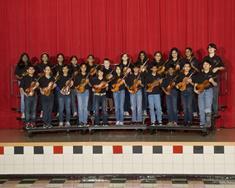 The Falcon Orchestra Program focuses on performing stringed instruments in orchestra family. Along with performance, orchestra teaches students life learning lessons such as Teamwork, Confidence, Communication, and Leadership, and Pride. 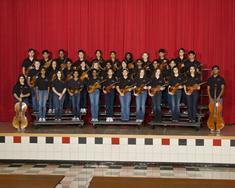 The Falcon Orchestra Program is proud to announce that last fall we had 48 students make the All-Region Orchestras. These students competed against 1000 students from 38 middle schools in Region XXIV. They represent Fowler with Pride! Our orchestras are Award Winning! From Sandy Lake Contest to UIL Performance and Sight-reading Contest to Peak's Music Festival....our Orchestras have been recognized and awarded the highest trophies at every orchestra level yearly. The orchestra program at the middle school begins in the sixth grade with instruction in violin, viola, cello, and bass. These students learn in a homogenous class setting, focusing solely on their particular instrument pedagody. Most 6th graders are part of this orchestra, which is comprised of beginning players. In these classes, we start from scratch with everything: how to hold the instrument and bow, how to read music, the best ways to make sounds, the best way to sit/stand, the history behind the music we play, and much more. These classes meet daily and focus on establishing and developing basic musical and performance skills. The Beginner Orchestra performs 4 concerts a year at Lebanon Trail High School, and compete at the Sandy Lake Music Festival in the Spring. This orchestra is composed of students with at least one year of experience. In this orchestra, the students continue their musical development by learning new techniques and faster, more complex rhythms. The orchestra performs four concerts each year at Lebanon Trail High School, as well as competes at the Pride of Texas Music Festival. Students may elect to participate in the All-Region XIV Orchestra to further develop their individual musicianship. This orchestra is composed of students with one or more years of experience. In this orchestra, the students continue their musical development by learning new techniques and faster, more complex rhythms. Students at this level can already demonstrate shifting and vibrato, and are committed to continuing their interest in improving their skills in orchestra. This orchestra performs four concerts each year at Lebanon Trail High School, as well as competes for the University Interscholastic League (UIL) concert and sight-reading Competition. Students may elect to participate in the All-Region XIV Orchestra to further develop their individual musicianship. The Symphonic Orchestra is comprised of advanced string players at FMS. They show competency in all major two octave scales, complex rhythms, vibrato and shifting, and most importantly, show commitment to their orchestra by attending all rehearsals and practicing. Most of the students in this orchestra are 8th graders, but there are several 7th graders, and a few 6th graders who can be admitted to this orchestra by audition. The main purpose is to be prepared for high school orchestra, so the expectation of practice and work ethic will be very high. Students will learn advanced techniques as well as perform increasingly difficult music as the year progresses. Advanced students will be STRONGLY encouraged to try out for All-Region Orchestra. Beyond the Fall, Winter, and Spring concerts, the Symphonic orchestra has several additional performances in school and community functions. These members will participate in the UIL Concert and Sight-Reading Competition in March, and possible performances at various events in the Frisco community and Dallas Metroplex. 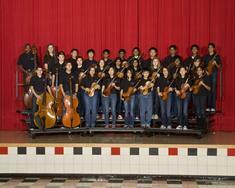 The Legacy Orchestra is comprised of THE MOST advanced string players at FMS. These students have at least 3 years experience and can demonstrate very high musical ability and technique. Only 7th and 8th grade students are allowed to perform in this orchestra. Students who wish to audition for this orchestra may do so after one full year of dedicated performance in the Symphonic Orchestra. The purpose of this orchestra is to challenge beyond imagination. Students will learn to perform advanced repertoire and exceed in their musicianship skills. 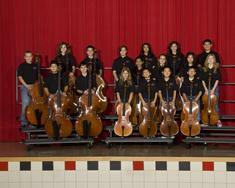 ALL Legacy students are required to try out for All-Region Orchestra. Beyond the 4 concerts a year, the Legacy orchestra will also compete for the UIL Concert and Sight Reading Competition, Peak's Music Festival, and Honor Orchestra State Competition. All Advanced Symphonic Students are required to take private lessons. Fowler Orchestra has a wonderful Harp Department directed by Mrs. Yumiko Schlaffer. Harp students must have a minimum of 3 years piano experience and are selected by audition. 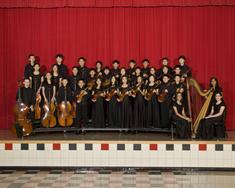 Harps particpate in all orchestra events and concerts, as well as district wide Harp functions. 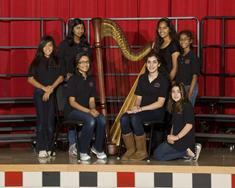 Harp students also particpate in All Region, Solo & Ensemble, and at the high school level, All-State.